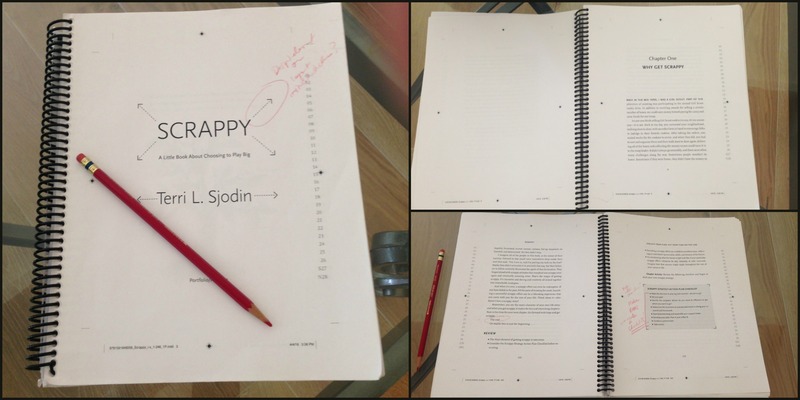 I have been working hard on editing my new book Scrappy. (Even when the manuscript has been accepted by your publisher, that doesn’t mean you’re done.) The last few months have been spent going through multiple rounds of revisions. (Yuck!) This is not my favorite thing to do. It’s important to finesse the stories in a way that makes the point but doesn’t labor it. I’m doing my best to keep it fast, fun, entertaining and still a content-rich book that provides real tools to help the reader. But I must confess that sometimes I read the same sentences over and over again and they all start to mush together. The challenge is… trying to beautifully tell the scrappy stories of other people without over editing the narrative, and yet keeping the heart and spirit of the story alive. That really is the hardest part. If you had an English teacher who wrote all over your essay papers with red pens, then you know what I’m going through. 50,000+ words and lots of red ink. The good news is: It’s done! Yahoo! I hope this somehow helps you with whatever project you are working on. I empathize with you and I applaud you. 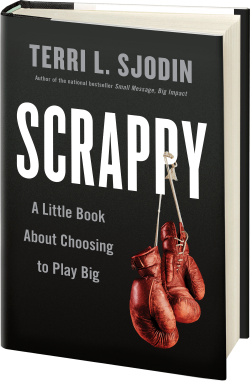 Up next – Stay tuned for the official Scrappy book cover reveal! Thank you for your interest in being part of the journey.